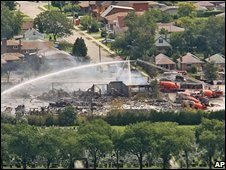 Most residents of an area in Toronto, Canada, who fled their homes after a gas blast have now been allowed home. 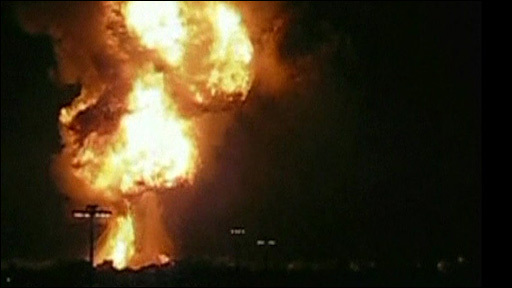 Thousands of people were evacuated from the north of the Canadian city early on Sunday after blasts at a propane gas facility set off a huge fire. A veteran fire fighter died while investigating the blast and an employee of the plant is still missing. Hundreds of people from houses with an asbestos risk or suspected structural damage have been kept from returning. Questions are now being asked about why permission was given for the facility to be built in a residential area. Following the blasts, which occurred at 0350 local time (0850 BST) on Sunday, a two-mile (3.2km) exclusion zone was set up. Police ordered residents in the Keele and Wilson areas to leave because of the threat of further explosions but on Sunday evening most people were allowed to return. About 100 homes remained behind police cordons on Monday, the Canadian Press reported, and their residents stayed in temporary shelters. Mayor David Miller told reporters that asbestos had been found at the site of the blast. "The problem with asbestos is, when it's disturbed and becomes airborne, it becomes dangerous to people," he said. Company officials said they were praying that the missing man, who has not been named, was still alive. He was reported to have been seen moving towards the scene of the explosion. Witnesses described the sky lighting up in the glow of an enormous fireball before turning black with smoke. Some residents said the blast caused their houses to rock. Windows were blown out, doors torn off their hinges and houses hit by large pieces of metal and parts of gas canisters which were thrown into the air. One woman told the Canadian media that the force of the blast threw her from her bed. "You could see the fireballs, one after the other," said Joanne Crockett. Ms Crockett told the National Post newspaper that some people were initially slow to respond to police orders to evacuate. "A lot of people were standing there, watching like they were fireworks. I was like, 'Get out of here people'." Sunrise Propane, which owns the facility, said in a statement that it was waiting to learn what caused the explosion. Some angry residents have demanded to know why the plant was allowed to be built in a residential area. Vicki Arcierio, who had to flee in her nightclothes with her children, told the Globe and Mail newspaper that she had always considered the plant to be "a danger zone". "It shouldn't have been put in a residential area. It should not have been there," she said. "Nobody did a damn thing. Nobody. And now the damage is done." A fire department official told the National Post that he saw at least five damaged homes but no completely destroyed buildings. "I've seen homes from explosion before where it's nothing but a pile of rubble. I didn't see any of that here," said Division Commander Bob O'Hallarn. He said the fire had spread over a large area and fire fighters worked to tackle the flames well into Sunday. Highway 401, one of the country's busiest roads, was reopened in time for Monday morning traffic but a no-fly zone remained in place over the site as a precaution.